Happy Christmas. Here’s the stuff you need to know before you tuck into the mince pies. EVERY MORNING (including Christmas morning), TheJournal.ie brings you the nine stories you need to know as you kick off your day. 1. #STABBING Pearse McCauley (the man who was jailed for killing Garda Jerry McCabe) was arrested on suspicion of stabbing his ex-wife in Cavan. 2. #ANTONIO MARTIN The mayor of Berkeley, the town where black teen Antonio Martin was shot dead yesterday, has said the incident cannot be compared with other police shootings which sparked major protests in Ferguson and New York. 3. #WAITING FOR SANTA IWantThisDeal.ie is facing complaints from scores of angry customers who say they haven’t received gifts in time for Christmas Day. 4. #BE NICE! Pope Francis, in his first Christmas message, has called on ‘arrogant and proud’ people to meet life with goodness and empathy. 5. #EBOLA A lab in America is testing a worker for Ebola exposure because of a significant mix-up. According to the Washington Post, researchers allowed potentially lethal samples of the virus to be handled in a much less secure lab. 6. #THE INTERVIEW Despite terror threats, Sony released its controversial movie The Interview today, BBC News reports. 7. #HOSPITAL George H.W. Bush (the older one) has spent a second night in hospital. The 90 year old was admitted because of shortness of breath. 8. #OVERPAID Adam Sandler is the most overpaid actor in Hollywood, apparently. That’s according to some statistical analysis by Forbes Magazine. It’s the second year in a row that the dubious honour has been bestowed on him. 9. #CRISP ‘N’ DRY Today will be cold, crisp and clear, according to Met Éireann. So there won’t be a White Christmas. But no Wet Christmas either. Not too bad, we suppose. Bonus Christmas Day content: DailyEdge.ie sit down with Ian Dempsey to reminisce over Christmas morning live in the Den. Email “The 9 at 9: Christmas Day”. 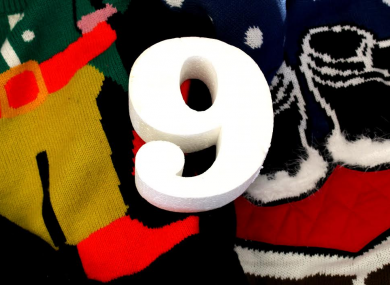 Feedback on “The 9 at 9: Christmas Day”.